There’s an old restaurant saying: if you want to sell it, crumb it. That sums up the schnitzel’s popularity. Frying it can create a mess, though. This easy, baking method is cleaner and uses a lot less fat. Blanch the basil in boiling water for 10 seconds; rinse in cold water; drain and squeeze out any water. Put in a food processor with the oil; pulse until combined. Preheat oven to 220˚C/gas 7; line a baking tray with baking paper. Halve each chicken breast. Place on a clean board and flatten with a mallet. Combine the breadcrumbs and paprika in a bowl. In another bowl, whisk the milk and eggs together; place the flour in a third bowl and season. Coat each escalope in the flour; shake off any excess; then coat in the egg mix and finally coat in a layer of breadcrumbs. Put them on the tray; brush the tops with the butter; bake for 7 minutes. Turn over and bake for a further 5 minutes. 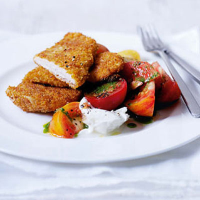 Cut the tomatoes into wedges and season; drizzle with the basil oil; add the mozzarella and serve with the schnitzels.